This is our very good friend Allison Collins, aka, Alley'Oop. She is one of the incredibly talented artists we work with to bring you amazing shows. This is just a small sample of her work. 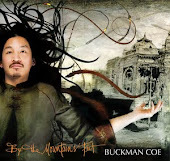 The musicians are Buckman Coe (who you already know) and Graham Ellsworth, an insanely talented jazz/funk drummer.